South East Wales encompasses many smaller counties that once formed the larger county of Glamorgan. These now include: Bridgend, Blaenau Gwent, Caerphilly, Cardiff, Merthyr Tydfil, Neath, Rhondda Cynon Taff, Swansea, Torfaen and the Vale of Glamorgan. The most easterly county in south Wales is Monmouthshire, which borders the English counties of Gloucestershire and Herefordshire. These once bloody borders have seen numerous battles and their volatile past is reflected in the many magnificent castles dotted along them. 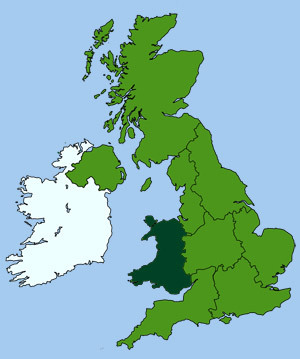 In fact, Monmouthshire contains more castles, per square mile, that anywhere else in the British Isles. Monmouthshire contains a rich and varied landscape, from the rugged mountains in the north to the lush green valleys of the River Wye. 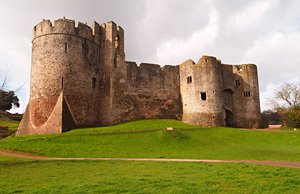 It has 31 conservation areas, encompassing many of its historic towns, such as Abergaveny and Tintern with its Abbey ruins. To the west of the county lies the ancient market town of Abergavenny, the gateway to the Brecon Beacons. The town's backdrop is beautifully framed by the dramatic mountains of this National Park, which rise to just under 3000 feet at Pen-y-Fan. To the far west of South East Wales lies the equally dramatic landscape of the Gower Peninsular, one of the most beautiful and unspoilt coastal regions in Britain. A place of pilgrimage for many a dedicated walker. Laverbread - a Welsh delicacy made from laver (seaweed) collected near the Gower. Caerphilly Cheese - a fine white crumbly cheese, once a staple food of coal-miners. Welsh Faggots - baked meat balls, often a favourite with miners and quarry-workers.